We know you have concerns when you come to RHRLI. That’s why all of our patients begin their process with a consultation with our doctor, Baiju C. Gohil, MD. We’ll explain to you why the ARTAS® system is the most precise hair loss treatment available, but we’ll also tell you let you know how any medical condition you may have will affect your treatment. When you come in to see Dr. Gohil, you will be given a thorough medical evaluation and exam. You’ll also have your medical history evaluated. Among the things you’ll be asked about are any medications you might be taking and any past surgeries you’ve had. You’ll also be asked about any allergies you may have. You will be given a local anesthetic during your procedure, and while some patients may be allergic to anesthetics, this is usually rare. The evaluation is designed to see if you’re able to proceed. One rare condition that could cause you not to be a candidate for hair transplant is Diffuse Unpatterned Alopecia, also known as telogen effluvium, according to the British newspaper The Telegraph. This is the second most common form of hair loss. According to WebMD, this condition occurs when you see a diffuse thinning of the scalp. It’s a change in the number of hair follicles actually growing hair and is often caused by stress. 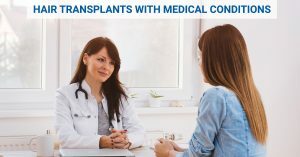 This condition and other conditions, that cause it to become difficult to find healthy donor hairs, can potentially disqualify a candidate for surgery. But because the ARTAS® system uses robotic technology, it is more precise in finding and transferring donor hairs than you’d find with other procedures such as strip surgery or hair transplants that use hand-held devices. In some cases, you might be asked to undergo further tests following your initial consultation, but this is rare. It’s important to know that there are few risks to your hair transplant surgery because the ARTAS® system is minimally invasive. The procedure will take several hours, so it’s a good idea to wear loose clothing to the procedure. Since a local anesthetic is used there will be breaks for meals and to take care of personal issues. The ARTAS® procedure is virtually pain free. There may be some bruising or swelling following your hair transplant but it will fade after 1 to 3 days. Most patients report little to no pain following their surgery. RHRLI knows that our patients are concerned when they ask us about our hair transplants. We also know that we provide our patients with a permanent solution to hair loss. We’re the only hair loss treatment center on Long Island that has the ARTAS® system and we can give you a new, healthier head of hair. Contact us today.